"After little change in 2016, the national homicide rate increased 7% in 2017, moving from 1.69 homicides per 100,000 population to 1.80. Police reported 660 homicides, 48 more than in 2016. The 2017 homicide rate was higher than the average for the previous decade (1.67 per 100,000 population for 2007 to 2016). 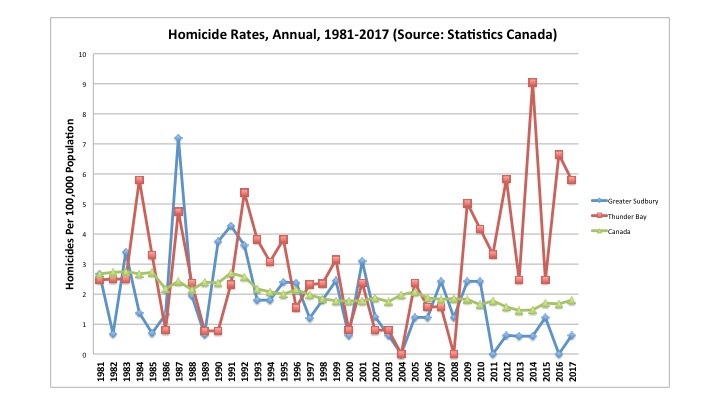 The attempted murder rate in Canada increased 4% from 2016 to 2017, to 2.25 per 100,000 population. 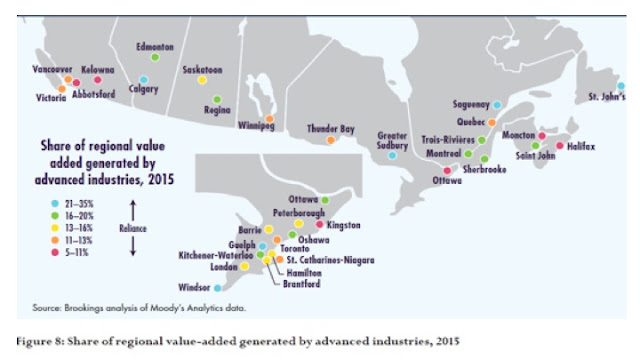 A 25% increase in the province of Quebec was the main contributor to the overall national increase. This was due to the January 2017 shooting at the Islamic Cultural Centre of Québec. This incident resulted in six homicide victims and 40 victims of attempted murder." I have done a number of posts on this topic over the years so its time to update some of the numbers. The two figures below plot the homicide rate (homicides per 100,000 of population) for Thunder Bay, Sudbury and Canada. 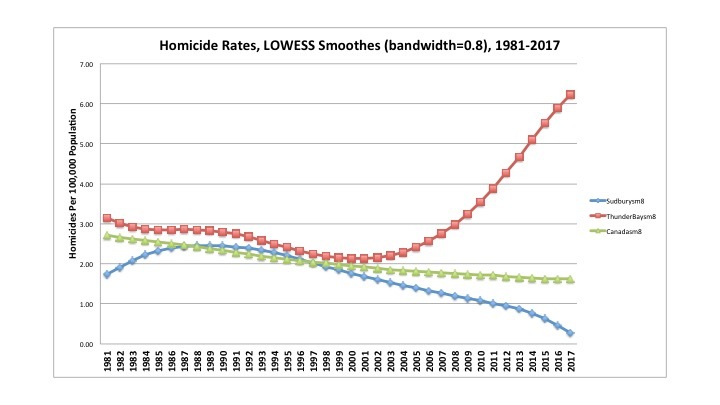 The first figure is the raw annual homicide rate while the second figure plots a smoothed series which gives you a better picture of the longer term trends. 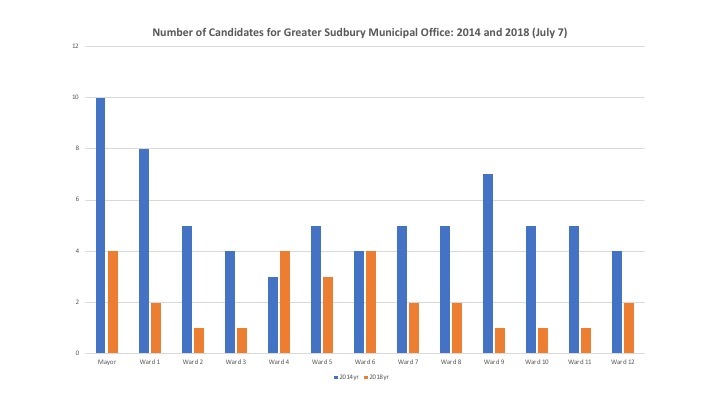 Annual numbers tend to have a lot of variation and you really should not base analysis or policy on one or two years of data. However, based on the smoothed series (LOWESS Smooth using a 0.8 bandwidth) you can see the picture that emerges here over the longer term. While the homicide rate in Thunder Bay for 2017 is down from the previous year at 5.8 versus 6.6 homicides per 100,000, the long term trend in one of increase. The annual un-smoothed data suggests the upward trend began circa 2008-09 while the smoothed series suggests that it has been a 21st century phenomenon with the rise starting approximately around 2000. 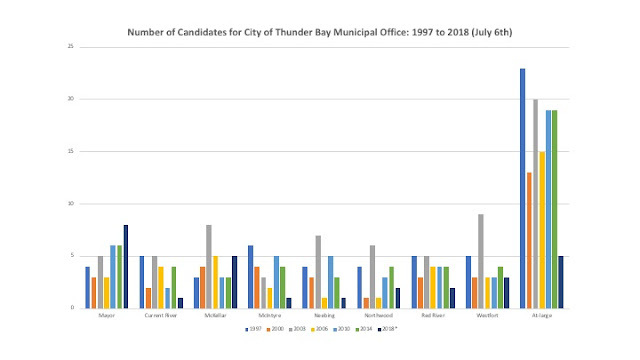 Thunder Bay's homicide rate has diverged from the national trend which has been one of decline. This is certainly one issue for the Fall 2018 municipal election. Well, I had so much fun writing this and posting it on Worthwhile Canadian Initiative that I decided it was worth posting here too! Quite frankly, we have all have been scratching our heads as the behaviour in some respects is reminiscent of 18th and 19th century monarchs gathering to decide the fate of wide swaths of the world in private meetings. Putin is an autocrat and Trump is a business autocrat who admires political autocrats, so their personal level diplomacy may indeed be a series of moves designed to remake the world and return it to an age when Russian and American led blocs were the only game in town. Both the Russians and the Americans have seen their political influence decline in a multilateral world led by growing Asia-Pacific economies and both countries have been less than comfortable with the rise of China. One has to wonder if this is an attempt by Trump to forge some type of private alliance with the Russians in an effort to coordinate their interests and deal with their ebbing international influence? The idea sounds like science fiction. Indeed, the idea of these two countries getting together and establishing a CoDominium actually has substance in an alternate reality – the science fiction world of Larry Niven and Jerry Pournelle. In their novel The Mote in God’s Eye, which was originally published in 1974, a series of treaties between the Russians and the Americans establishing the CoDominium in the 1990s sets the stage for a global government and the expansion of the human species out into the galaxy. This of course would place Trump’s musings about setting up a Space Force into quite an entirely different light. Indeed, is Donald Trump drawing inspiration from a mythical civilization disrupting character known as a Crazy Eddie? Trump may be trying to engineer some broader type of Russian-American political alliance to counter their waning influence in the world driven by a nostalgia for the 1960s and 1970s. After all, the rise of the Chinese economy and the growth of Chinese military influence is seen as a potential concern in some circles. It does not matter how far-fetched the idea may seem given everything else that has been happening lately whenever Donald Trump takes the world stage. Disrupting the world, wrecking the liberal economic order and creating chaos and then having America and Russia step in to fix things may seem crazy but does it make sense to foreign policy experts? And, while Trump may be thinking along these lines what is Putin really thinking? I doubt he is a Niven and Pournelle fan. Of course, one expects that greater formal cooperation between the Americans and the Russians will ultimately require Congress to sign-off especially if actual treaties are eventually negotiated. On the other hand, if it is all kept informal and behind closed doors, who knows what is eventually going to emerge?